Most American silver manufacturers of the late nineteenth and early twentieth centuries offered some variant of the Chrysanthemum pattern. As faithful readers of our little web page will know, here is my favorite one of them all. Perhaps it was their location (in Concord) near the wilderness of New Hampshire where examples of this subject matter were easily found, perhaps it was the lingering influence of Arthur Stone who supervised their design department from 1884 through 1887. 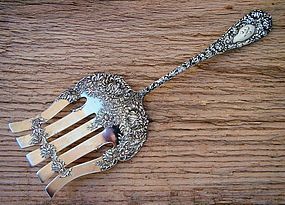 Whatever the reason, with this and other patterns such as Iris, New Art and Cat Tails, Durgin produced some of the most artistically successful of all American flatware patterns. We've been hunting down an asparagus server for several months, but until now haven't encountered one that didn't have issues-- too high a price, unsatisfactory condition-- which ruled it out. We are quite pleased to offer this one.